So I made a post about all of my rules when it comes to writing good Dialogue a little while ago, NOW I'm going to give you some tips and advice on how to follow them, and overall become a better writer at dialogue. Trick Number One: Practice Dialogue coming from your characters. Something I find the MOST useful (Seriously it really helps. ), is sitting down at your computer/notebook, opening a blank document/page, and start to write from your characters POV. It doesn't matter if your original story is in Third Person or First Person, Past Tense or Presence, write as if this is your characters Journal. Write about their day at the park, write about being attacked by a monster, let the character talk about himself/herself, his/her looks, taste in clothes, favorite hobbies. Just the random thoughts a REAL person would write down in a Journal. It may be hard at first to speak through your character, but after a bit they take over. But still, you really have to pick your brain sometimes about what they would say, how they would say it, what they would talk about, ect. It helps you to not only get to know your character WAY better, but it also helps you to learn their VOICE, which is just important. You learn the little things about them that make them REAL. It's YOUR job to do that. So ask them questions, answer them as your character, become their best friend, because, overall, that's what they are, right? Remember to do this with not only your main character, but preferably ALL of them. Yes, even the 'Villain'. Advice Number Two: There should only be two different types of Dialogue in every book in the world. The two different types of dialogue is: dialogue of the main character talking to the reader (The Narration), and the Dialogue among the characters. That's it, no strings attached. 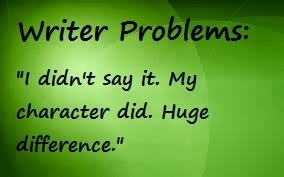 So if you get into this mindset, that it's really not so different writing your characters conversations as it is your character talking to the reader, it gets a LOT easier. Tip Number Three: Each character should sound different. No, I don't just mean the two main characters, or the three best friends. I mean, EVERY character. That person they passed on the street, the guy who only comes in on one chapter, the Villain, ALL of the supporting characters. If you put them in the book, you need to dig deep into EACH AND EVERY ONE, important or not. Human speech varies from person to person. EVERY SINGLE personality is different, so EVERY SINGLE speech pattern is different, so don't go halfway and make a random statement, even if it's out of the characters voice. If you know your characters as well as you SHOULD, this will come completely natural. They will speak for you, and YOU will do your job as a good little author and simply WRITE IT DOWN. But what do we do about those side, SIDE characters who we don't know the backstory to, the life details, the little things? I have a few characters like this, that aren't THAT big, but still have a few things to say and do. What do I do to figure out their voice? I do what I do with all of my other characters; talk to them. Learn about them. Ask them questions. It may seem useless, and completely boring, but it helps overall with the story. If you want to go HALFWAY with something, then writing is NOT for you. Trick Number Four: Speech can easily be conveyed through EMOTION. 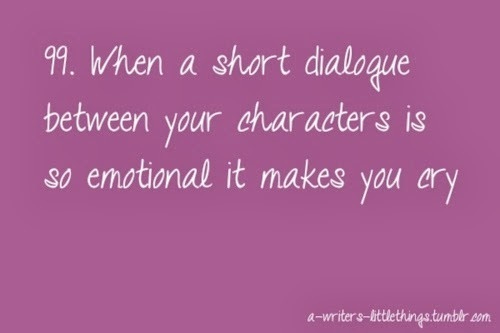 Emotions are a vital part in making realistic dialogue. If a character is worried, show us they are through what they say, how they say it: How loud, how quiet, how slowly. Is there voice shaking? How do we KNOW they're really worried? You should be able to close your eyes, and imagine just HEARING the characters voices. What do you hear? "I looked back up at them and shrugged casually. “I guess this means I’m completely powerless. You can kill my friends now.”"
"“Whatever. So, are you here to kill me, or what?”"
You can just HEAR the sarcasm. Another big key is the actions that go along with the dialogue. It's there to help; So USE IT! “You’re not touching any of them.” I was surprised at the fierceness in my own voice." "Don't touch any of them!" This could come across panicky, almost frantic. Perhaps angry, but not as a fierce growl as the other one suggests. Practically the same thing, but the tiny word choices make a BIG different when it's delivered. This is a bit frantic, but angry. Without the note that she 'hissed', I would guess she was panicking. Would you? Advice Number Five: There is a Balance with He said/She said. I read somewhere that before, after, between Dialogue there should only be: He/She said. I read that an author should never use He growled, She cried, He groaned, She whispered, ect. BUT. I COMPLETELY disagree. COMPLETELY. It's not a book without the dialogue clarifications. USE dialogue narration. It helps convey the words properly, it makes it easier to read, and it's just fun sometimes. BUT (Again). There IS a balance. You have free reign with the dialogue narration, but make sure not to go overboard. Sometimes a simple 'He said, she said' at the end/before/between a line of dialogue is all it takes. In fact, I enjoy it when books does this sometimes. IF the words are chosen good enough, it doesn't take more then He said. Reader's can figure things out for themselves sometimes, so give them that chance. Chances are, they'll imagine it being said just as you did. But I must agree that there are many occasions where the He said She said just isn't enough. Okay, so I think I picked and prodded this whole 'Dialogue' thing WAAAAY too much, but I hoped I may have helped someone! I'm looking forward to doing a post on creating believable, effective Villains, so stay tuned! Do you have any Tips/Tricks/Advice for Writing good dialogue? What is your favorite part about Dialogue?